Are you ready to have your kitchen or bathroom feel like brand new, without the cost of a major renovation? A new set of luxurious fixtures may be exactly what you need. Whether you need a new bathroom fixture or you’re looking for a modern upgrade for your kitchen, The True-Pros should be your plumber of choice. Whether you need a sink or a faucet replaced, repaired, or just upgraded, True-Pro is here to help. You don’t have to renovate an entire bathroom to get a new look and modern feel.Just simply upgrading your fixtures or shower can make all the difference! 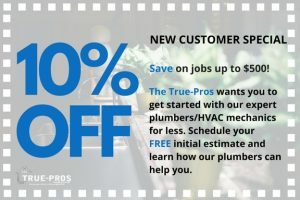 Why Should You Choose True-Pro As Your Plumber? At True-Pro, we have 21 years of experience behind us that allows us to handle any plumbing need that you have or can think of! We are dedicated to providing plumbing services that always surpass your expectations. Anytime that we work with you, we promise a satisfaction guarantee, and even extend warranties of our work. We offer appointments at a variety of times to allow you to have access to our master plumbers at any time or place that works for you. We know that you have a variety of options open to you, but we look forward to meeting and exceeding your expectations.